Caramel is one of my favorite flavors (chocolate optional), I love it pretty much any way it can be eaten. 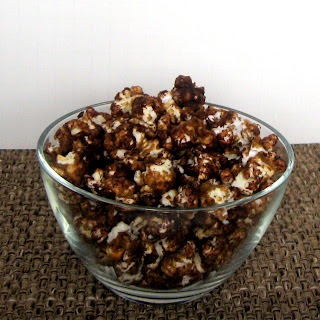 My husband actually came up with the idea of making the caramel and chocolate popcorn and I am so glad he did. It is so. good. A nice light crunchy coating of caramel with a little bit of chocolate on it really adds to the flavor. This would be great for a snack bowl for Fall or as gifts in little bags. If you were feeling wild you could surely mix in some candy corn, nuts, or another traditional Fall candy. Ours didn't last long enough to try out that idea. One thing I will say is that after it is refrigerated then it's much better because it's so much more crunchy due to the chocolate hardening. It's also definitely not as messy. If you eat this right after you make it, it will be good but you will be covered in chocolate. It really needs the refrigeration. It doesn't make the popcorn soggy (that was my fear). We managed to keep it in the refrigerator in a zip-top bag for two days and it was just as good until my husband took the 1/2 cup that was left to work to eat. I was sad. I used dark brown sugar because it's what I had but you could use light brown sugar if you would like to. It will turn out the same :). I don't feel like this recipe took too long to put together but waiting for it to chill enough so I wasn't covered in chocolate was hard. I used air popped popcorn that I popped but you could surely use the microwave bags if you wanted too. I also had a little caramel left over that I didn't put on the popcorn, so if you think that your popcorn is coated in caramel enough, then stop. It only needs as much as you want on it. I put my leftover caramel in a small dish sprayed with non-stick spray then cut it up. 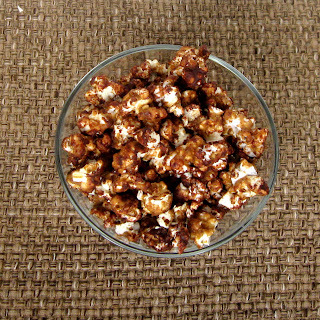 And please, please spray the bowl you are tossing the popcorn in when you're adding caramel. It will make cleanup so much easier (although then you may not have leftover caramel because it will be stuck to the bowl). Happy popcorn making! 1. Preheat oven to 250F. 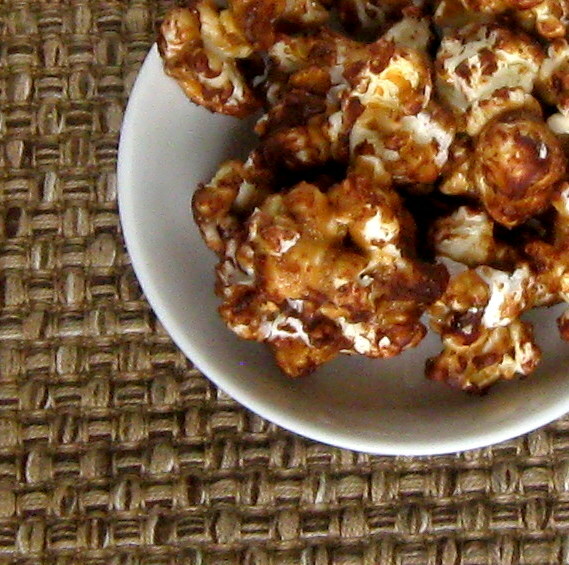 Place the popped popcorn on a cookie sheet and place in oven to keep warm. 2. In a medium saucepan melt the butter over medium heat. Add the brown sugar, corn syrup, and salt, stir to combine. Bring the mixture to a boil while stirring constantly. Without stirring, let the mixture boil for about 3-4 minutes (I used dark brown sugar and it started to smell a bit burnt, although it wasn’t, at 3 minutes so I pulled it off the heat). Remove the pan from the heat and add the baking soda and vanilla extract, stir until blended. 3. 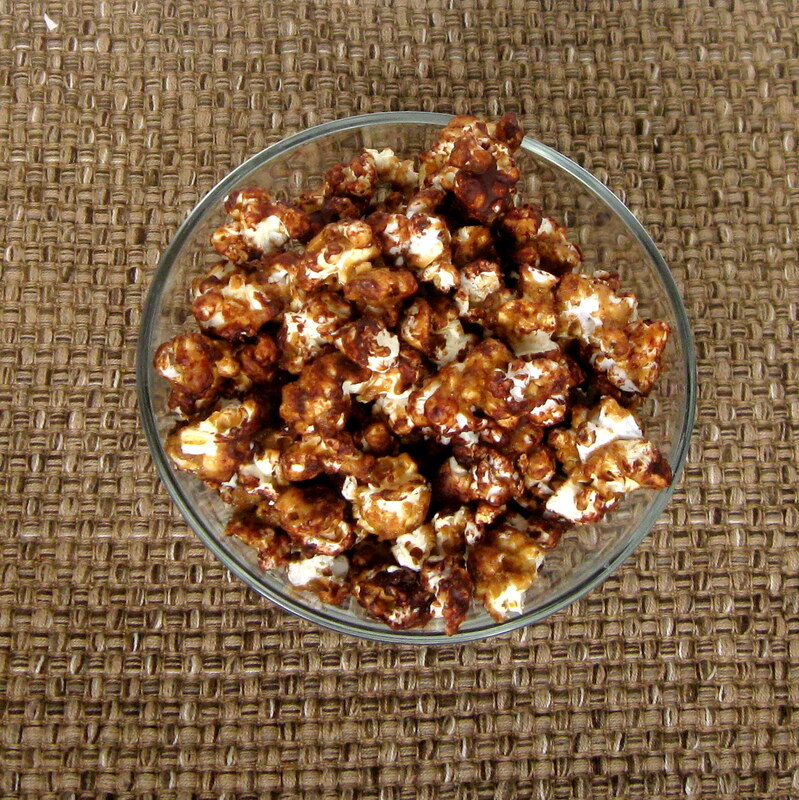 Remove the popcorn from the oven and place in a large bowl (that has been sprayed with non-stick spray). 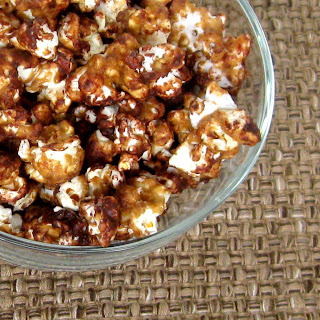 Drizzle the caramel over the popcorn and stir until the popcorn is coated. Pour the coated popcorn back on the cookie sheet (I recommend covering the cookie sheet in foil or non-stick spray) and place it back in the oven for 30 minutes. 4. Melt the chocolate chips in a small bowl in the microwave for 30 seconds, then 15 second intervals, stirring well in between, until melted and smooth. Remove the popcorn from the oven and place back into the lightly greased bowl. Drizzle the melted chocolate over the popcorn while tossing the popcorn to coat the popcorn in the chocolate. Refrigerate for at least 10 minutes to help harden the chocolate so that you’re not getting covered in chocolate while you’re eating it. At this point I ate some and refrigerated the rest to help harden the chocolate. 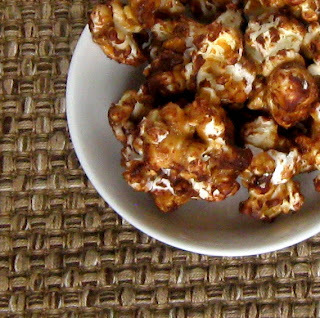 I ate more of the popcorn the next day straight from the refrigerator and it was 10 times better than the night before because it was crunchy and the chocolate had hardened. The popcorn itself was not soggy or soft (which I was concerned about) but it was a great texture. Meatless Monday! French Onion Soup Sandwiches!